Big things come in small packages, and June’s monthly reward card is no exception. This month, we’re taking a look at a new Dark Elf with a low magicka cost but a lot of versatility: Prophet of Bones! 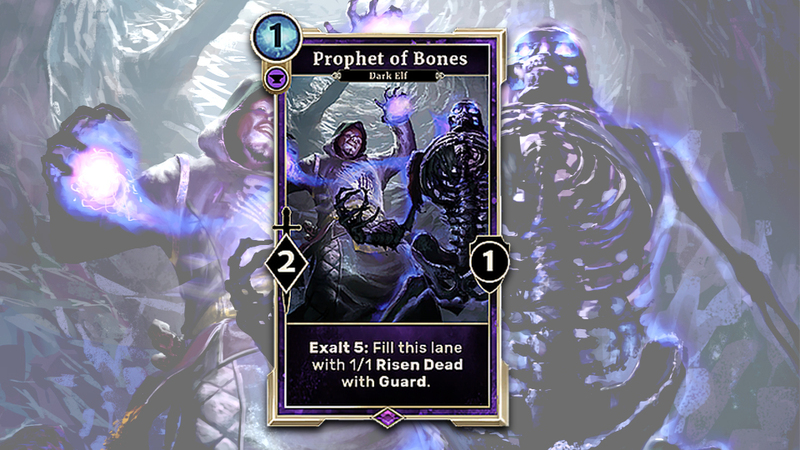 Prophet of Bones is the first monthly reward card to have Exalt, a new ability first released in the recent Houses of Morrowind Expansion. You can play Prophet of Bones for just one magicka and get a reasonable 2/1 body on the board for your trouble. However, if you find yourself with a lot of extra magicka, you can pay the Exalt cost when you play Prophet of Bones and be rewarded for your efforts with additional value. Exalting Prophet of Bones will cost six magicka instead of one, but in return you’ll fill an entire lane with skeletons! Since Prophet of Bones itself will be in the lane, your efforts will grant you a maximum of three additional 1/1 Risen Dead with Guard. While that might not sound like a lot as your game develops, Prophet of Bones’ power comes from being usable at all stages of the game. It can also be enhanced by several other cards. Looking to take advantage of the Risen Dead you just filled your lane with? Consider using Skeleton Champion to buff them all by +1/+1! Alternatively, if Prophet of Bones is but one of many creatures with Exalt in your Tribunal deck, you can play it early on and then use Temple Patriarch to summon the Risen Dead for free – while also activating any of your other Exalt abilities. There are a lot of ways to use Prophet of Bones, but first you’ll need to secure your copies of the card. Achieving rank nine in June will award you your first free copy, while rank five will give you two and rank one and Legend will give you the whole playset so you won’t have to spend any soul gems. Jump into the Ranked ladder today!